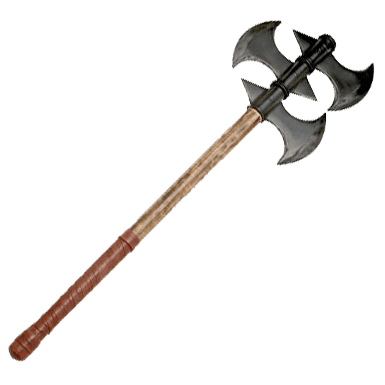 The Conan the Barbarian Miniature Triple Axe of Rexor by Marto is the axe once wielded by Rexor in the Conan the Barbarian movie, reproduced by the smiths at Marto so that everyone can enjoy this wicked weapon at full-size. This axe has not lost any of its traditional hallmarks, having been recreated with accuracy as the main point. Consisting of a simple wooden haft with a triple-headed blade fastened at the top, this axe possesses one of the most esoteric axe-heads ever witnessed, featuring three separate axe-heads that are mounted together, staggered so that two face one direction and one faces in the reverse. The effect created is an axe that is both intimidating and effective, thanks to the ability to reverse swings quickly. By appearances alone, this is typically a weapon first and a decoration second, although as a reproduction, it serves more adequately as an item of decor. 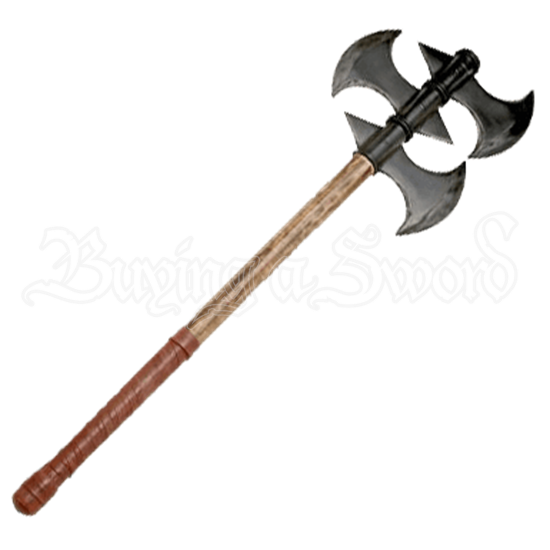 Regardless of its original purpose, the Conan the Barbarian Triple Axe of Rexor by Marto is a fantastic little reproduction item that is not only well-crafted, but wicked to look at.